The Honda Accord is one of the most reliable sedans on the road in Charlottesville, VA. It is packed with features that are sure to please even the toughest critic. Let Harrisonburg Honda give you a tour of the Accord today. If you demand more out of your driving experience, then there is only one vehicle that meets your needs. The Honda Accord has a proven track record that has lasted for decades and is one of the most reliable sedans on the road today. 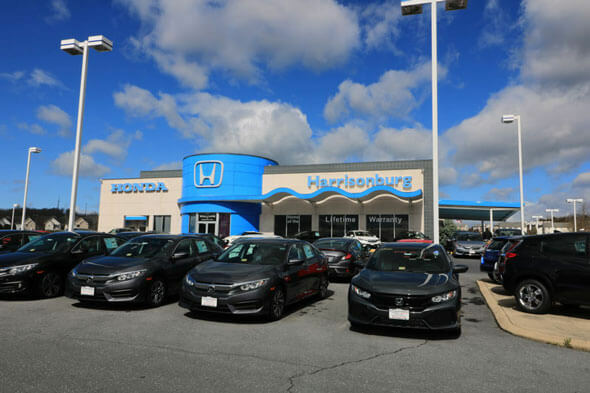 It has the comfort, convenience, and safety features you want and we have them in stock for you at Harrisonburg Honda. We all know that the Honda Accord is roomy and that it has plenty of leg room for rear passengers too, but it has so much more to offer. Imagine this frigid winter using the remote start feature to warm your Accord prior to getting inside. You can in the Accord and there are even heated front and rear seats that help to soothe you and warm you to the core. You can even customize your driving position with the 12-way power adjustable drivers' seat. When the heat is on the outside, the Accord gives you ventilated seats in the front and rear to cool you on those sultry summer days. You command the weather in your Accord no matter what the elements outside may bring. Everything within the cabin is ergonomically placed so that drivers won’t have to reach far to access everything they need in order to take control of their drive. Let Harrisonburg Honda show you how the Accord can help take your daily drive to the next level when you stop by and visit us today. If you are like us, you don’t have a minute to waste in your busy day. The same is true when you are on the go. You need to make every minute count because you have errands to run, chores to do, and a family, not to mention a job too. The Honda Accord helps you accomplish more on the go because it offers smart technology that is capable of helping you achieve your tasks. Android Auto and Apple CarPlay allow you to use your voice to accomplish many tasks. For instance, you can text your teen to see if they need a ride home from lacrosse practice, make a phone call to grandma to see if she can still babysit for date night, schedule your hair appointment in your calendar, get turn-by-turn on-screen directions to the bakery, and stream your favorite music that sets the mood to get things done. Just imagine how much time you can save while inside of your new Honda Accord! There is even a wireless charging pad to keep your phone powered up. Your Accord serves as a mobile hotspot thanks to AT&T so your kids can stream on the go too. Let our tech experts give you a demo at Harrisonburg Honda. It’s nice to have comfort, convenience, and technology that makes driving enjoyable, but it is necessary to have a safe way to arrive at your destination. This is where the Honda Accord really shines. That is because it is filled with accident avoidance technologies that make driving better. You can change lanes with confidence in your Accord thanks to the Blind Spot Information that monitors your blind spot. There is even the Collision Mitigation Braking System that helps you to avoid a rear-end accident and the Adaptive Cruise Control with Low Speed Follow to help you maintain a safe distance. The Road Departure Mitigation System and Lane Keeping Assist System help to keep you on the road and safely in your lane and will gently guide you if you don’t take action. The Accord even offers a Traffic Sign Recognition System in its Head-Up Display that makes driving safer. See these features and more at Harrisonburg Honda today. Harrisonburg Honda is your one-stop shop for all things Honda including the Honda Accord. We are honored to have the chance to serve you and are proud to offer you a great selection of the popular Accord to choose from. Whether you are looking for the base model or the Touring model, we have exactly what you have been searching for in one convenient location. We will take the time to listen to your needs and help you find the Accord that fits your lifestyle without breaking your budget. We welcome you to come down and talk to one of our friendly, knowledgeable, and courteous sales professionals today so you can drive home with your new Accord within hours of starting the process.